Newly presented evidence shows that early humans interbred with Neanderthals, Denisovans, and now, shockingly, a fourth undocumented hominid species. The paleoarchaeologists who made the discovery are now saying that ancient Eurasia was a "Lord of the Rings-type world," a landmass containing many hominid populations. As to the identity of the new species, scientists haven't the "faintest idea." 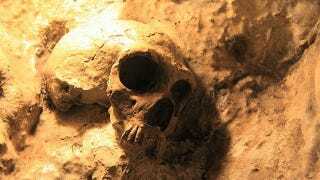 Image: An uncovered skull (unrelated to this news) via Wikimedia commons.